We tend to measure the success of a modern civilization by the products it produces and that its people use. Tangible things are easier to count than the quality of ideas. 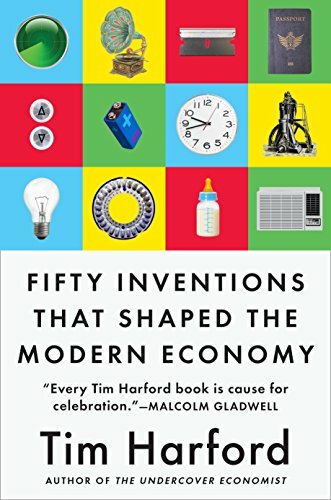 Tim Harford, a British economist and journalist, in Fifty Inventions that Shaped the Modern Economy catalogues where many of those modern “things” came from and how they impacted on our wealth and resources. He tells these stories wonderfully without burdening the reader with too many technological and scientific details. Each chapter is four or five pages long, and his narrative is cleverly written. He makes science and economics both informative and fun. However, using this short-form of nonfiction leaves the reader wanting more. Each of the fifty inventions is worth book-length treatment, and, based on his talented performance here, Harford could make that enterprise delightful. Horford’s book is well annotated for those who want to pursue further research, although his “tasting menu” approach will be sufficient for most people. Harford’s treatment wanders from plows to video games. Some of these inventions were the creative work of a single person. Most, however, flowed from the efforts of many hands and minds over periods of time. While some may question his selections, each choice is fully explained within the constraints of his short format. You learn just enough about barbed wire, infant formula, TV dinners, paper money, barcodes, and light bulbs to be informed. In addition to its fluid writing, the book as a whole demonstrates much learning and logic. There is a downside, however, to Harford’s project. For the most part, Harford regales these inventions. They certainly have had numerous positive impacts on society. Yet, each has in some ways diminished our modern civilization. The ubiquitous smart phone has made society less collegial and social. With heads directed toward screens and not people, these hand-held computers isolate us from one another. Robots are wonderful, but they will eliminate jobs for workers in the lesser-skilled population. Videos games offer artificial fun, not real playtime, for our children. Most importantly, the computerization of our confidential information has opened our personal lives to intrusion. Can we really afford that much innovation? Harford should set his sights—and his insights—on less tangible assets that have had an even greater impact on modern life. The ideals of the American Declaration of Independence—the “all men are created equal”—set an aspiration for all people, but has been achieved by very few. The concept of limited governmental interference with the private lives of individuals—for example the right to privacy and reproductive rights—has enormous potential if universally implemented. Who invented these ideas and how was that accomplished? Of course, there would be no way to ignore the negative prejudices that pollute modern society, but their stories are equally vital to the development of civilization. A great popular writer like Tim Horford should broaden his focus. He has the talent to make much of modern life understandable and accessible.